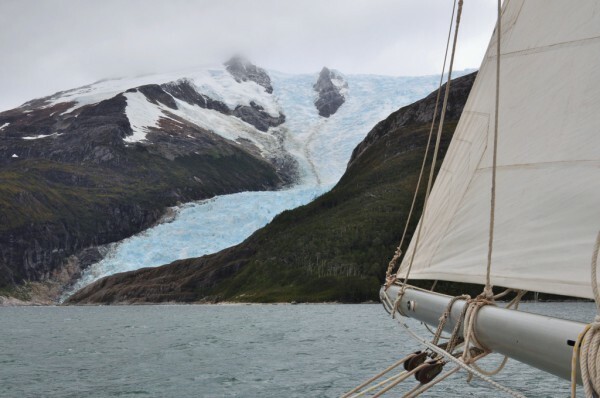 Day Four of our six day cruise in the Beagle Channel was spent anchored alongside Polarwind. 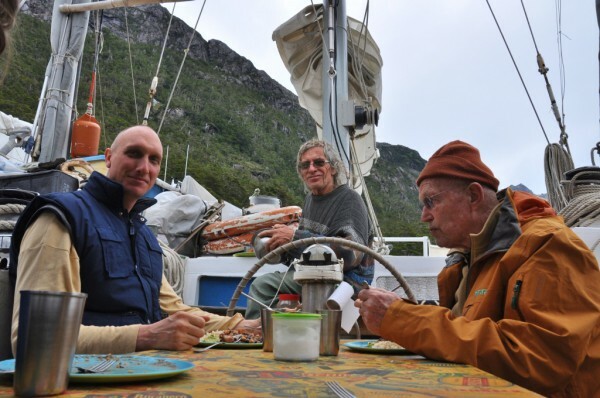 In fact, by the time we had run back down the fiord from the glacier, on the previous evening, there was already another little charter yacht moored to Polarwind‘s other side – so, in fact there were three of us snugged away in the cove, all set to ride out the storm which was forecast to come our way on the morrow. Had these been three cruising yachts moored together by chance then a spontaneous luncheon party would inevitably have resulted, but although we were well acquainted with Oswaldo and his crew and had also previously met the captain of the other yacht, Ksar, there was little communication between the boats. It seems that charter guests like to keep to themselves. I wondered whether the sight of two robed men might excite the interest of some of the tourists – but, no; no one came rushing over to pay their respects or to ask questions. I was sad for them. Didn’t they realise what an unsurpassed opportunity they had stumbled into? No, of course they didn’t. All they could see was two shaven-headed ‘weirdos’ wearing wrap-around cotton skirts when everyone else was clad in thermal trousers. So we had our own private Dhamma talk, with Luang Por Sumedho responding to questions put by Nick while I, meanwhile, tried to focus my mind on preparing Chick-Pea and Coconut Curry, with rice, to be followed by a fruit salad and home-made yoghurt. Given that I counted every moment with these ajahns (or teachers) more precious than gold, and every utterance of theirs a jewel for my careful consideration, it’s amazing that I managed to get the cooking done at all… But done it was, and in time for our Sangha to eat it before the prescribed hour. Since the weather was unusually warm despite the gale, we set up the cockpit table and ate al fresco, in the amphitheatre of the surrounding mountains. After the meal the anchorage began to fill with oversized ice cubes. Luang Por retired for a well-earned rest, Roxanne and Ajahn Asoko disappeared into their respective cabins – she to study her books, and he, I assume, to study his mind – and Nick and I had fun helping the other yotties to push and pull the floes elsewhere, so that they didn’t damage our boats. 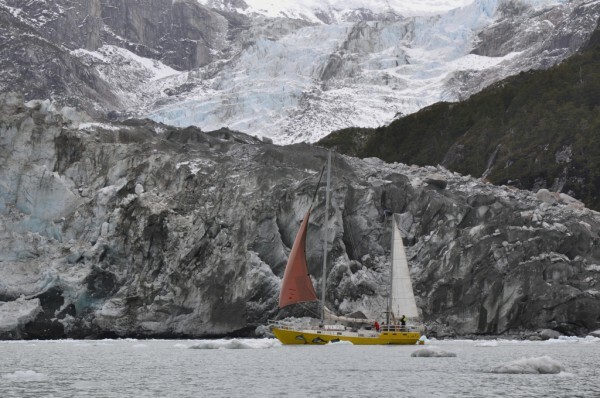 Eventually the two old hands set up a line across the anchorage in an effort to hinder the ice from reaching us. 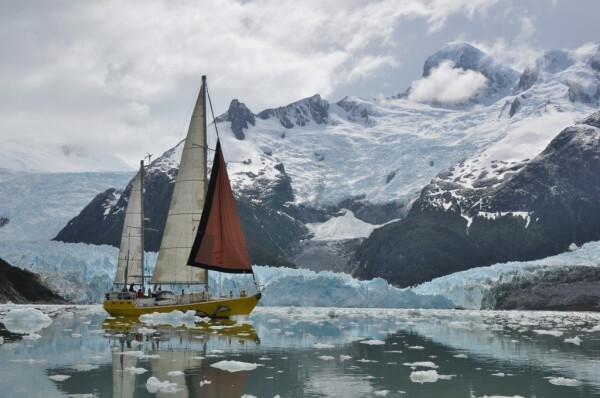 Now we took ourselves up the eastern arm of the fiord, past the spectacular glaciers – one white and one black – which issue into the lower part of the inlet; on through another moraine, where the depths are barely sufficient to let Mollymawk pass; and around the corner to the very head of the gorge, where the most beautiful glacier of all awaits discovery. And never mind the spelling, because spellings are entirely arbitrary. The pronunciation is exactly the same. No one seems to know why Pia is so called, but this reason will do for me! The glaciers themselves currently lack names – so, in keeping with this theme, I propose calling them Dukkha, Anicca, and Anatta. These are the three ‘marks of existence‘ pointed out by the Buddha, and they are characteristic even of beauty. Dukkha, as I have explained before, means unsatisfactoriness. I’m applying that name to the glaciers at the head of the eastern inlet, because the murkiness of the right-hand one mars the brilliance of the left, demonstrating the impossibility of ever finding perfection. The glacier half way along this same inlet is hereby named Anicca, which means impermanence. That appellation hardly needs explanation. Solid though it seems, the glacier is perpetually sliding into the sea. The first glacier that we visited, in the western arm, I would like to christen Anatta, and here my reasoning is tenuous. Anatta means No Self, and it is by far the hardest of the three characteristics to identify. However much we may rationalise the matter, observing the impermanent nature of our bodies and also of our thoughts and feelings, we still cling to Ego; we still feel that there is a fundamental “me” behind everything. How does this apply to a glacier? Well, it doesn’t really… What the two have in common is that both are incomprehensible. 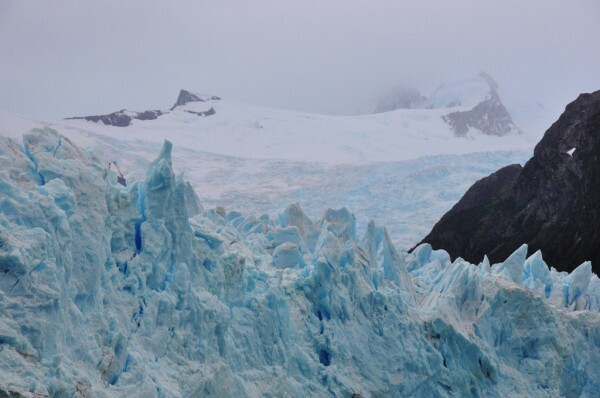 Anatta is beyond the ability of our reasoning mind to comprehend; and the glacier, meanwhile, is disobeying the pattern displayed by all the other ice sheets in this vicinity: While they recede, in response to the warming of the atmosphere, this one is advancing. No one has yet been able to comprehend why. We tip-toed close to the wall of ice hereinafter known as Anicca. 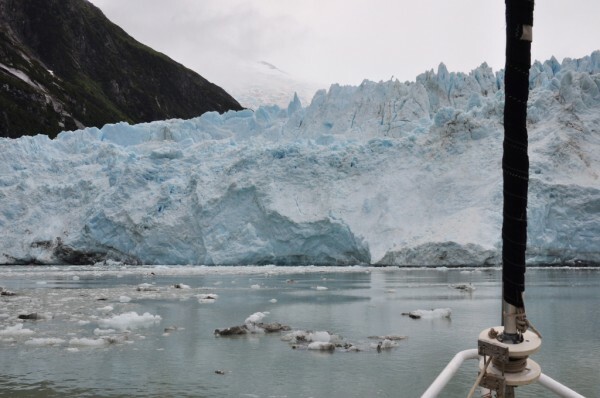 Not too close – not closer than three times the height of the glacier – because then, if it suddenly calves (or drops a berg) there’s a danger that the resultant wave might roll the boat. But we went close enough to feel the cold breath of the frozen monster. Ajahn Asoko identified a large crack; and Roxanne observed it and reckoned it was getting bigger all the time. “Go on! Drop it!” we urged the beast. Every few minutes we were startled by the gunshot of a new crevasse opening somewhere beyond our view, and from various points along the wall came the occasional crash and rattle of smallish chunks of ice tumbling down the blue-white cliff – but we wanted something big to let go. If you’re a high-latitudes expert and this idea scares you, I must repeat that we were well beyond the danger zone and in 90 metres of water. 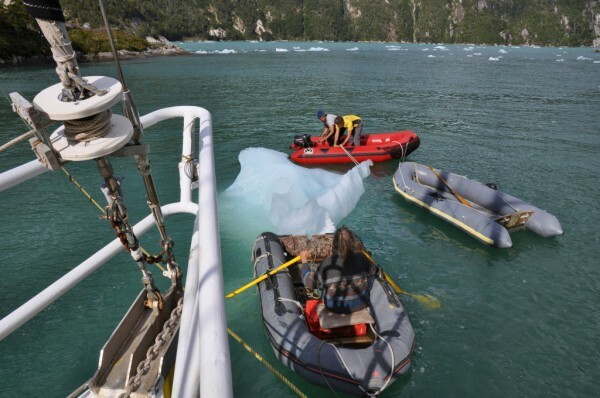 The cubic-metre boulders which the glacier was now and then dropping barely caused a ripple. Out in the open channel once again, we found a fair breeze blowing – and, at last, we were able to show Ajahn Asoko how a sailing boat works. Mollymawk bowled back down the corridor, past Romanche, Alemania, Italia, and the rest. With the wind now on the stern we had only to sit there and enjoy the ride. The sails billowed as the wind rose from force five Beaufort to force six and then seven. 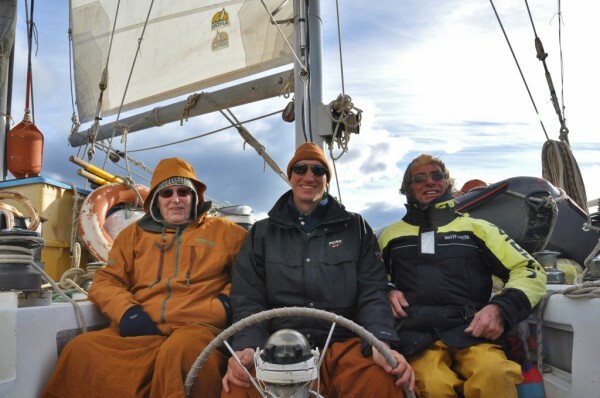 By the time we reached the place where the northern arm of the Beagle rejoins the southern, we were doing a steady seven knots (whereas our top speed under engine is just five), and as we entered the wind acceleration zone east of the divide the wind increased further and the log touched 9.3 knots. The sea was speckled with white caps. By now we had dropped the main and were carrying only the half-furled genoa and the mizzen, but Mollymawk kept surging along. I could feel the wind throbbing through the rig, bringing her to life, and I hoped that Ajahn Asoko could feel it too. He had stayed on deck throughout this glorious adventure, helping to handle the sails every time we needed to gybe. I’ve noticed in the past that those who succeed in understanding and practising the Buddha Dhamma are generally very intelligent – much more intelligent than me – and certainly, Ajahn Asoko fell within this category. Not content merely to be told to “pull on that string”, he had quickly learned the names of all the various pieces of line – the halyards, sheets, warps, outhauls, preventers, and what-not – and having asked Nick to show him various useful knots he had also learned these – after just one demonstration! Combined with his imperturbable mindfulness, this ability to learn made him into a kind of instant mariner. My mind ambled off, away from the present moment, cooking up fantasies of a Buddhist retreat on a sun-soaked, uninhabited atoll in the Tuamotos. I can’t see Luang Por wanting to join us again… but it would be fun to be able to take a couple of monks out into the vast blue yonder and show them the peace and solitude and the indefinable but indisputable ‘aliveness’ of Ocean. What better demonstration of Anicca than this ever-changing environment, where one day the world is wild and threatening and then, a week later, that same place is as soothing to the spirit as a warm bath is to the aching body? What better place, in a world devoid of tiger-infested forests, to watch one’s mind jiggle about in response to the promptings of real or imaginary danger? “We can be Wat Pah Mollymawk,” I said. Wat means monastery and Pah means forest, in the Thai language; and although both forests and Thai might seem irrelevant to the life on the ocean wave, this is the tradition which was followed by Luang Por Sumedho during his time as a monk in Thailand, and it’s the tradition which he has spread around the world. When one considers that the tradition goes back 2,500 years… Well, it’s not something to be casually thrown off. 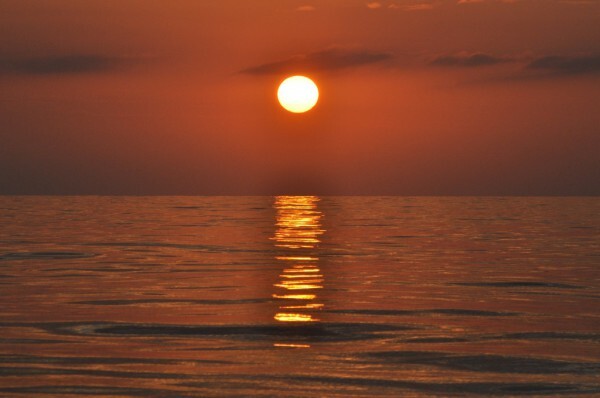 Then again, the ocean also merits a mention. The Buddha lived hundreds of miles from the sea, but he’d evidently heard about it, and he used it as a simile. For example, he spoke of the ocean of Samsara (which is this worldly, and – according to the Buddha’s teachings – endlessly vast cycle of existence). I asked Ajahn Asoko to tell me the Thai word for ocean. “Wat Pah Maha Somut,” I then declared. The Forest Monastery of the Great Ocean. Our forests will be coconut palm groves. Luang Por chuckled when I shared my little fantasy. I imagined that he would promptly declare the marine environment to be a hopeless one for Dhamma practice and would recommend that I quit messing about and pack myself off to a monastery, forthwith. 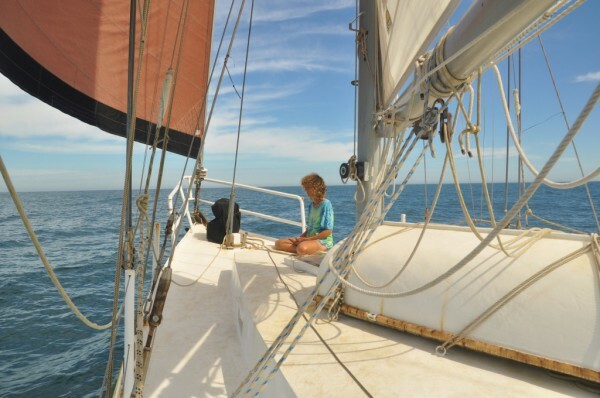 With so much work needing to be done in order to maintain the boat, there often seems to be no space in the day for contemplation or meditation. And the life of a sailor is full of distractions and irregular happenings, hindering the formation of a steady routine. 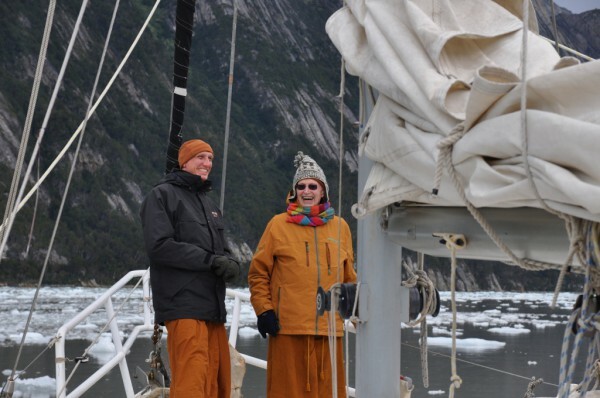 Gales and sail changes, whales blowing nearby, ice forming alongside – these things won’t wait while the Dhamma practitioner finishes her meditation. 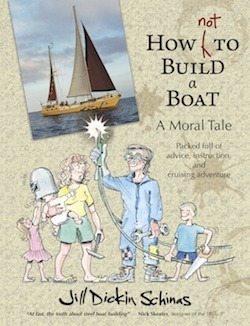 For me, neither of these things is true – I find more danger in crossing a country lane than in walking to the foredeck – but I was glad that my revered mentor had identified something positive about the lifestyle. Having bowled westward from Estero Pia until the sun was ready to take his leave of us, we anchored for the night in a little nook called Caleta Eugenio. Here, in the lee of the low-lying rocks and bushes, the water was as flat as a mirror. 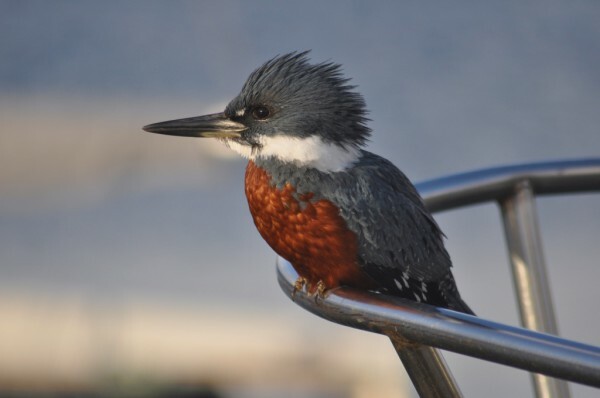 After we had dropped the hook and Roxanne had run a couple of mooring lines ashore, Ajahn Asoko mentioned the word walk; and Poppy promptly jumped into the dinghy. “Now you’ll have to take her,” I said jokingly – and to everyone’s surprise, the monk followed the dog into the boat. “Have you ever rowed before?” enquired Nick. 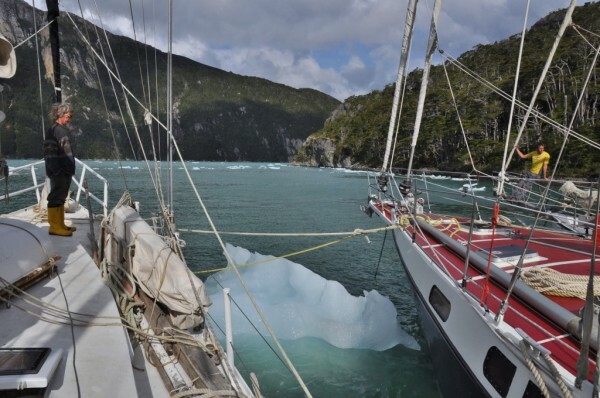 The last thing one wants is to have the dinghy – and one’s guest – go disappearing out of the anchorage on the tide. 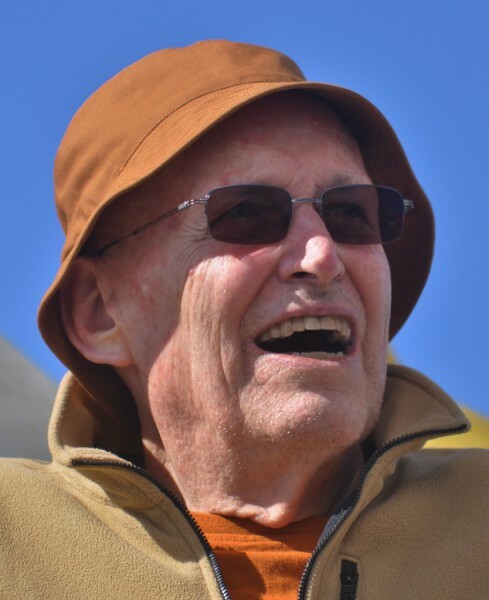 “Not really,” Ajahn Asoko answered, “But I’ve watched you.” So saying, he embarked over the unblemished sea, pulling with almost the same ease and grace of a man who has been rowing all his life. Luang Por Sumedho watched these events with an expression of bemusement on his face. “Your secretary has hidden talents,” I said. “So I see!” And with a chuckle, the venerable elder retired to his den. Breakfast having eventually been prepared and consumed, we attempted to sail out of the caleta, or cove. But the breeze was still no more than a sigh sweeping occasionally over the trees. With rocks awash on either side of the narrow pass it was no easy matter to proceed and we soon needed recourse to the engine. That old Mercedes had done us proud over the past week. I think that our previous maximum engine time must have been the day we spent five hours scurrying towards Staten Island in avoidance of a force eleven storm. 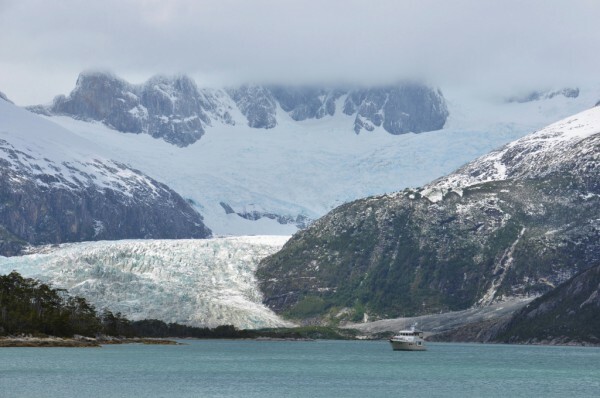 Pressed by our guests’ tight schedule, we had necessarily spent two days during our cruise to the glaciers motoring from dawn till late in the afternoon – but that antique engine had never faltered. Every second of every minute of every hour during those two long days its four pistons had each hammered up and down 18 times. If you motor everywhere, or you drive a car, you probably take this kind of thing for granted, but for me the workings of that machine are an absolute miracle; and not a minute passes when I don’t expect the thunderous noise to cease – probably with the shriek of metal tearing itself apart. As those of you who have read the book of the boat will know, this old engine comes from a wrecked fishing boat. It spent a month under water and six more rusting on a quayside. It owes nothing to anyone. Moreover, it has to suffer the indignity of hearing the crew regularly denigrate internal combustion and its damaging effects on the environment. Due to our antipathy for motoring, it spends months at a time sitting idle. But when called upon, the beast leaps into action like a spider who, having spent six weeks without stirring, is still ready to land a pounce on a passing beetle. One press of a button is all it takes, and those pistons are hammering up and own, achieving 60mph on each stroke, 36 strokes per second. Per second! It is, most definitely, a miracle. 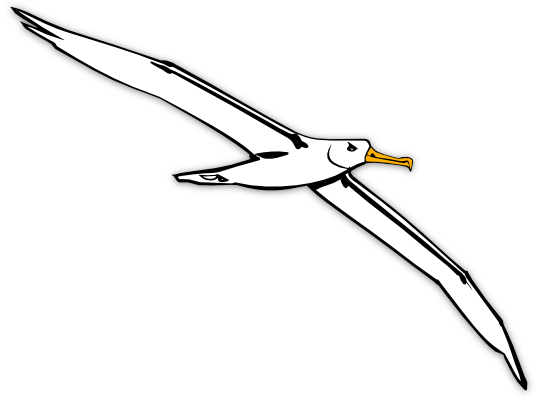 But on the final day of our voyage the skipper disdained to use it. Once we were clear of the cove, he called for me to shut the engine down again, and we spent the next few hours drifting along at one knot under a limp spread of canvas. 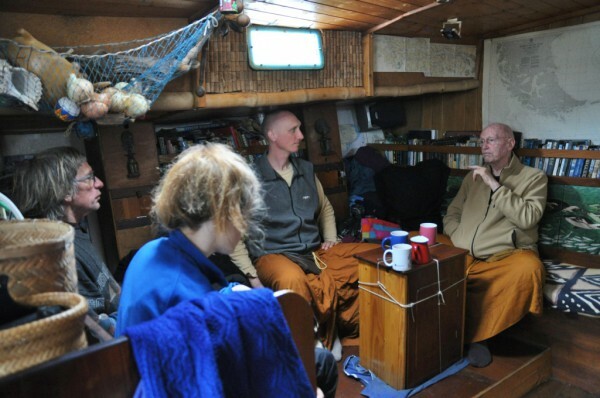 Ajahn Asoko stayed with Nick in the cockpit, and they exchanged information about Buddhism and boats. I was preoccupied with cooking the meal, but when the breeze kicked in, and the boat picked up her skirts and started to romp along, Luang Por Sumedho and Roxanne also went on deck to enjoy our last day together. Roxanne had cooked a lemon meringue pie, and after taking the edge off their hunger with the vegetarian stew which I had knocked up, both monks accepted first and second helpings of this delicious pudding. Notwithstanding the fact that our other provisions for them may have been lacking, I felt that we had not done too badly in the matter of feeding our honoured guests. It was a long chant, and while the men uttered the words, in the ancient manner established just after the Buddha’s passing – (in a style more simple even than the singing of psalms; with the words largely on one note) – the cabin filled with a warm reverberating hum of peace and goodness. 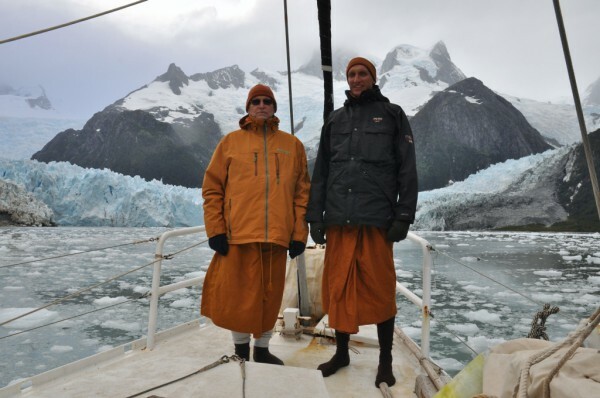 Luang Por was now in very good spirits and spent the entire afternoon on deck or in the main cabin. Either he had settled in and was happy to be in our company or else he was simply relieved to be heading back to terra firma. By the time we reached Puerto Williams, at 18.00, the day had become quite cold and it was starting to rain. 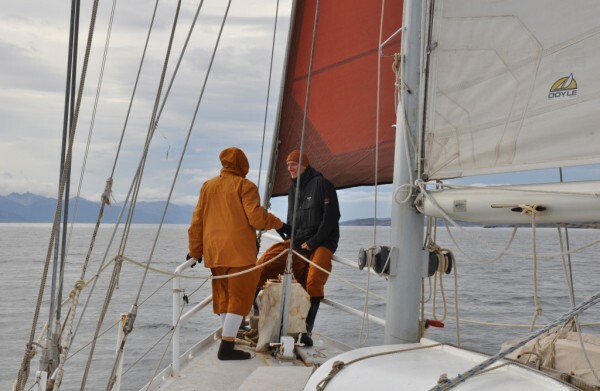 Nevertheless, Ajahn Asoko stayed on deck to help as we came alongside the Micalvi. Caesar and Gean and a few of our cruising friends were on hand to take our lines. Once we were snugly moored, the boys came below, and we exchanged news. (Caesar was about to head off in much the same direction whence we had just come, on Northanger). Then, all urgent business having been discussed, Luang Por had to face a new barrage of questions – this time not from a Dhamma follower seeking advice but from a sceptic who finds the belief in rebirth as silly as the idea of a tea cup orbiting Saturn. He bore the assault very well, but I imagine he must have been quite glad that Caesar hadn’t been aboard with us for the past week! On the following morning, Nick and I whizzed around at panic pace – organising a taxi to the airfield and preparing a packed lunch – while the monks, on the other hand, remained calm and mindfully present. Ajahn Asoko had just discovered that there was only one hour between the arrival of their flight in Santiago and the departure of their next one to New Zealand; and during that hour they had to wait for their luggage, in the usual fashion, collect some other belongings left at the house of the Thai ambassador, return to the airport, and check in for the international flight. So far as I could see, it was totally impossible, but he was completely unfazed, and Luang Por didn’t even bat an eyelid. In fact, he didn’t even chuckle; he just kept right on mindfully eating his porridge. Due to some misleading input from the airline company, we scurried round to the airfield an hour and a half before the little local flight was due… but rather than fret and faff (as I was doing), Ajahn Asoko calmly gave me a final Dhamma talk about mindfulness. What is all this talk about mindfulness, you ask? “Mindfulness is the path to the Deathless. Heedlessness is the path to death. The mindful never die. The heedless are already dead.” So said the Buddha. And so wrote Luang Por Sumedho in our visitors book. “May your meanderings on the ocean be guided by mindfulness,” Ajahn Asoko had added, on the following page. Mindfulness had, indeed, been the core topic during our informal retreat. Eventually, the plane landed. And my honoured guests both expressed their gratitude for what Ajahn Asoko called “the trip of a lifetime” whilst I simultaneously thanked them for having blessed me with their company. We bade each other farewell – but without exchanging the hugs that are de rigeur during even the most casual hello and goodbye in South America, for such things are taboo in Thai Buddhist circles. The two sienna-clad figures walked out across the tarmac and were engulfed by the plane. And a few minutes later they vanished up into the sky. I went back to the boat, still in a state of nervous excitement; still in a state of disbelief. How could I possibly have invited two senior Forest monks to join us in our shabby little home? And how could they possibly have agreed to come? Opening the curtains, I found that Caesar’s cabin was just as I had prepared it, seven days earlier, with the sheet smoothed down and the pillow at one end of the bed and the quilt at the other. And the aft cabin was just as it was when I vacated it. Not one book or cushion was out of place. Perhaps the whole thing was just a dream. I love your blog entries! You seem to be in Victoria, BC. 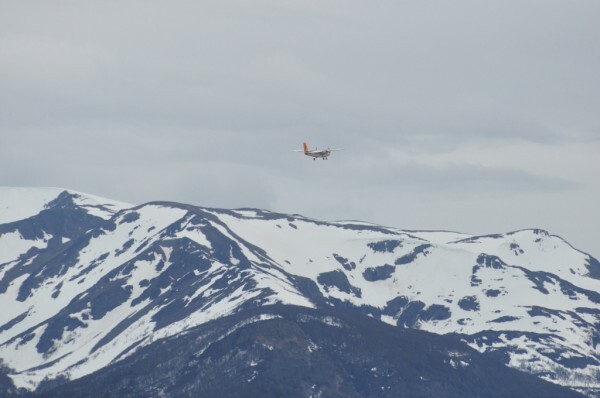 I once spent a few months there, flying float-planes with Cooper Air. (Maybe you’ve run into Richard Cooper?) It’s a wonderful part of the world, and I’m hoping that we’ll get up there some day in Mollymawk. What a grand read. Thank you. Thank you for this wonderful narrative. it is always wonderful to read about LP Sumedho. I am of course Ajahn Asoko’s greatest fan. His presence is just so calming. I have just returned after spending a week with these venerables in Ratanawan. Thank you for the beautiful description and sharing this with us. Thank-you too, for your kind comments. Whilst the memories may have wained for you, they are immortalised beautifully in your visually stunning words. My father lied about his age and went to sea in the last of the commercial sailing vessels that ran from Dunedin, NZ to London, UK. Those trips were via the Horn. 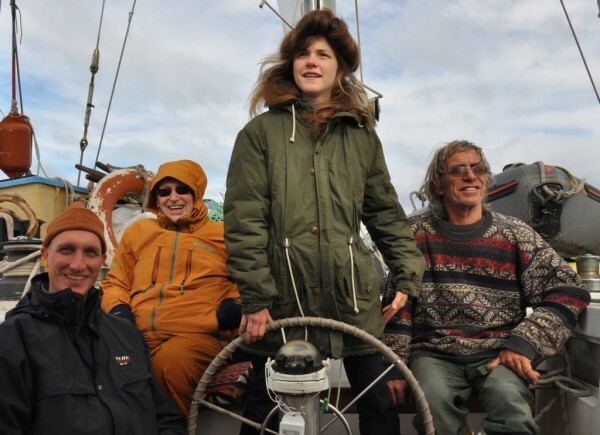 He retired from the sea as a Master Mariner to marry and bring up a family. His final work was as a whaler in Western Australia. I was brought up 400m from a sailing club and that was my playground until I went to uni to pursue my passion for the ocean and complete studies in the marine sciences.